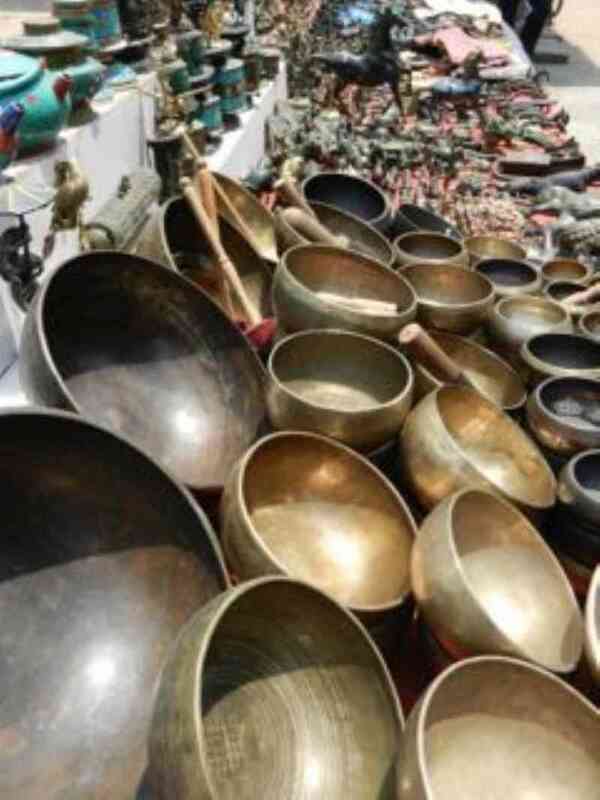 I've been zonked by the healing singing bowls. In a small corner of the busy markets of Kathmandu is a place noted for it's brass bowls - especially rare one hammered into shape once a year on during the full moon of the birthday of Buddha. I had an amazing experience with sound. Sort of a deep alto myself, to hear the sounds these bowls send out is like experiencing shivers (goose bumps?) in a assonant choral harmony. These bowls have sounds that vibrate for up to two minutes, once gonged, and a sense of peace surrounds you completely. Their healing capacity is based around the Buddhist idea of chakras - mainly those of the brain, the throat and the heart. My brain and heart are probably irreparable but my vocal chords have been gravelly from the dry air, so I decided to see what was up with this healing bowl. The young healer picked an antique brass bowl in the sound of G. He hit the bowl with his hand and the sound vibrated within me as he passed it around my neck. Hmmm. On a larger bowl filled with water he showed me the difference in a female sound and a male sound. He used a padded pestle to rub it around the edge of the bowl until a beautiful sound emitted. But when he went for the masculine one, rubbing the pestle at a sharper angle it caused the water to bubble like a fountain on high boil. Wow. 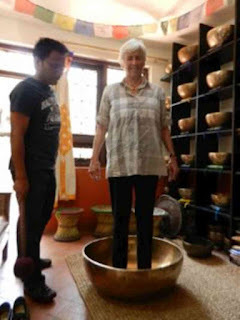 Then he asked if I wanted to stand in a huge bronze bowl which can cause the whole body to vibrate as he gonged it repeatedly. Shut your eyes, he said. You won't fall. Sure, why not. And it was an amazing experience with deep sound that seemed to be right and similar to the Om sounds one hears in ancient Christian and Buddhist chants. I asked a lot of questions but don't think my voice is any better. Oh well. It was the most fun I'd had since I got to Nepal. As we prepare for Tibet, I try to learn more about the Buddhist, quiet advocates of simplicity. Monks in their red or yellow robes and sandals are everywhere laughing and praying and even perusing the shops. They get priority boarding on airplanes. Their monastaries are havens of peace and art. Prince Siddhartha, living a luxurious life, born to a Hindu king in Nepal, left wife, son and fancy life to be an ascetic in 550 BC and he became The Buddha. Three historical personages brought Buddhism to Tibet: first an Indian Guru in the 7th century during the reign of a Tibetan King. Then that King married a Nepali princess Ricuti who was called the Green Tara. Then a Chinese princess Win Cheng married the same king and was called White Tara. Once again, notice the trinity of its creation and that women were involved. If you go deeper, you learn there are four schools of Buddhism Nyimgma-pa was the first, then Kagyu-pa founded in 1000 AD (and is dominant in Mt. Kailash region); Shakya-pa in the 11 century AD was the theological branch that studied Buddhist scriptures; Gelug-pa began in the 14th century and is the Yellow Hat sect of the Dalai Lama (you see pictures of the Dalai Lama in strange curved yellow hats). These names pop up often in discussion but they are difficult for Westerner to spell and understand. I think each school determines a person's way of living to reach spiritual perfection. Buddhism is a religion, a philosophy, a search for true self and purporting to cease worldly suffering and reincarnation is the theme in Tibet. This is the reason Dalai Lamas are looking for their successors, someone to follow to complete the mission of enlightenment. This is when the essence of the soul is developed through rebirth in successive lives until a state of perfection is obtained. But many modern Buddhist Rinpoches, Lamas, etc are wary of reaching true Enlightenment where they are no longer of this world nor can they have images in monasteries. I was told the current Dalai Lama prefers to stay in the world to make it a better place of peace, to be useful to other Buddhist in need and attempting the walk to Enlightenment, and just helping those in need. If I understand it correctly, if a child is found to be the reincarnation of the Dalai Lama, then Enlightenment carries on, but if not, then he continues to advocate for the poor and needy and the world. Whew - that's enough of that but from here on out, the destinations we have seem to be adjuncts of Buddhism. 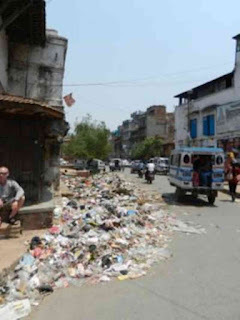 I'm relieved to be leaving Nepal. Currently there is a political uprising causing city-wide strikes where no one works or can get to work (unless they walk) and protests in the street can become violent. Garbage is piled everywhere. It is a response to an effort by the Maoist party to divide Nepal into ethnic or tribal groups and designate for them areas to live in and from which they would have representation in the government. There are 60 ethnic groups who have been living in harmony for years. They don't want to be separated into lots. The government proposes a sort of a modern apartheid that has everyone up in arms. And it is a bitter subject that fills the newspapers and the conversations of the day. Namaste. Special for Herb Lane: Nisamanee Lertworapong. Find that. Non criminal popular figure in these parts. TAKE HERB'S ADVICE AND MAKE SURE VEGETABLES AND POTATOES ARE THROWN IN THE HEALING BOWL WHEN YOU ARE STANDING IN IT! WE WANT YOU TO COME HOME SOON, BUT NOT IN A SOUP CARTON!!!! THAT WAS QUITE A DETAILED HISTORY LESSON YOU GAVE US IN THIS POSTING ON THE BUDDHIST RELIGION. VERY INTERESTING! WHEN DO YOU GO TO THE BASE CAMP! SINCE WE ARE VICARIOUSLY TRAVELING WITH YOU, HOW ABOUT GOING TO HAWAII NEXT YEAR!